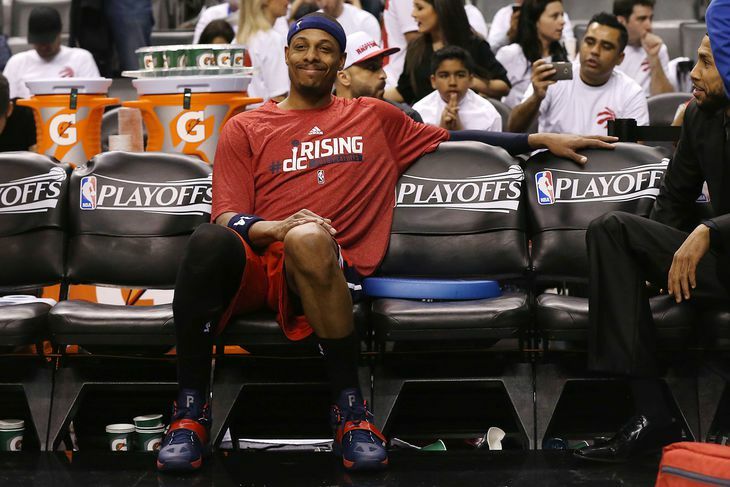 Paul Pierce is exactly what the Washington Wizards have needed for the past decade. He’s Gilbert Arenas without the guns. He’s JaVale McGee with an IQ above four. He’s Andray Blatche without.. well he’s just not Andray Blatche; which for Washington is phenomenal news. The Wizards personnel moves over the last few seasons have been questionable to say the least. Consisting of entertaining characters who didn’t know how to win, squandering talent had become the ultimate description for the lowly Wiz. Paul Pierce is a crunch time player. He’s the perfect veteran presence to compliment rising stars John Wall and Bradley Beal. The 37-year-old can be a teacher of trade until late game heroics are needed. That’s when the Truth will step in. Saturday night, Washington was in the midst of blowing a 21 point lead. Something they successfully did this time last year against the Indiana Pacers in the Eastern Conference semi-finals. That was without Paul Pierce. This year, the Truth wasn’t going to let that happen. Every team needs a Paul Pierce. Every team needs that player who brings along the wisdom that is needed to win an NBA title. Someone with the veteran swagger to say, “Get out of my way” in the waining seconds of a tie game. It’s that type of player that provides a backbone for a team that, without him, would be doomed for an early playoff exit. Losing John Wall to injury means the Wizards’ season is all but doomed. But Pierce’s buzzer beater Saturday night provided the shot in the arm that the Wizards desperately needed in beginning to proceed without Wall. Thanks to Pierce’s presence, Washington has a little more hope. The truth is the Wizards have been looking for Pierce for years. And they finally found him. Ask any NBA GM and I guarantee you the majority would love to have Paul Pierce in their locker room. He’s a winner and a gamer who knows how to succeed in a league where very few find a consistent formula to do so. Yet he’s been figuring out ways to win for 16 straight seasons. Bottom line, The Truth hurts. Just ask the Atlanta Hawks.